Crock pot recipes are all about convenience. Just throw it all in and you have dinner ready with minimal work! Everyone and their mother (literally) has a crock pot. Or if you’re me, you have two! Crock pots are a universal favorite way to make easy and delicious dinners without having to slave over the stove for hours. One gray area that a lot of people wonder what types of foods cook well in a crock pot. Pasta is often one of those foods that is tricky to work with when using a slow cooker. You don’t want to end up with mushy noodles as texture with pasta is everything. Today I’m sharing my best tips for how to cook pasta in your crock pot! Yes you can! This is a commonly asked question and one that leads to a lot of confusion. You can absolutely cook pasta in your crock pot, and there is no need to cook it on the stove when you intend to use it in a slow cooker recipe. If the dish you are making uses pasta as an ingredient that is great! No need to worry about firing up the stove, just keep reading! Here are my top tips for cooking pasta in a crock pot. Remember that every recipe and pasta is different, so not every cook time can apply to each type of pasta! Add pasta in raw (no need to cook at all or rinse it). Follow recipe specific instructions for optimal pasta texture. Know your types of pasta – which ones cook fast, which ones can sustain a longer cook time (for example, ziti can handle longer cook time than macaroni noodles). Check pasta often for doneness towards the end of cook time to avoid mushiness. Keep experimenting! Cooking pasta in the crock pot can save so much time! Here are several recipes with pasta that I have cooked in a crock pot. 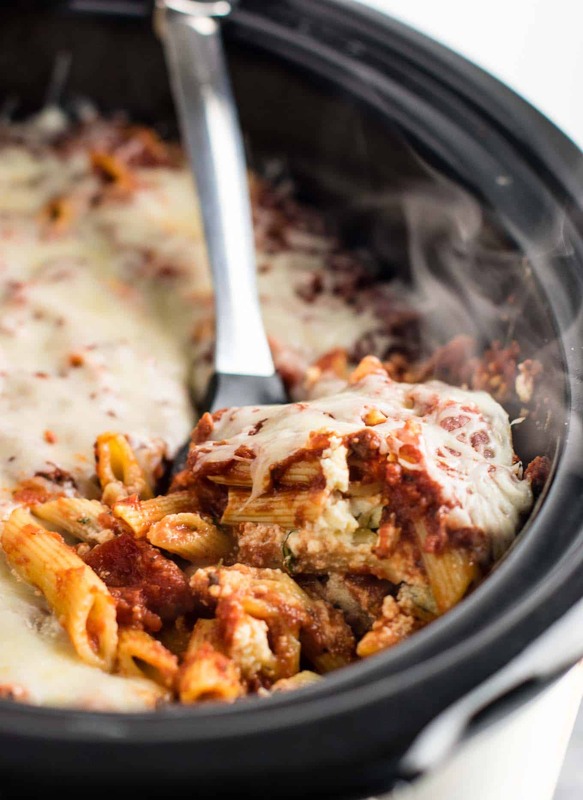 Crock pot baked ziti is one of my go to recipes to feed a crowd. It is easy, it only takes a few minutes to prep, and is packed with so much flavor. Not to mention your house smells AMAZING while it cooks. Can you put raw pasta in a slow cooker? Absolutely! 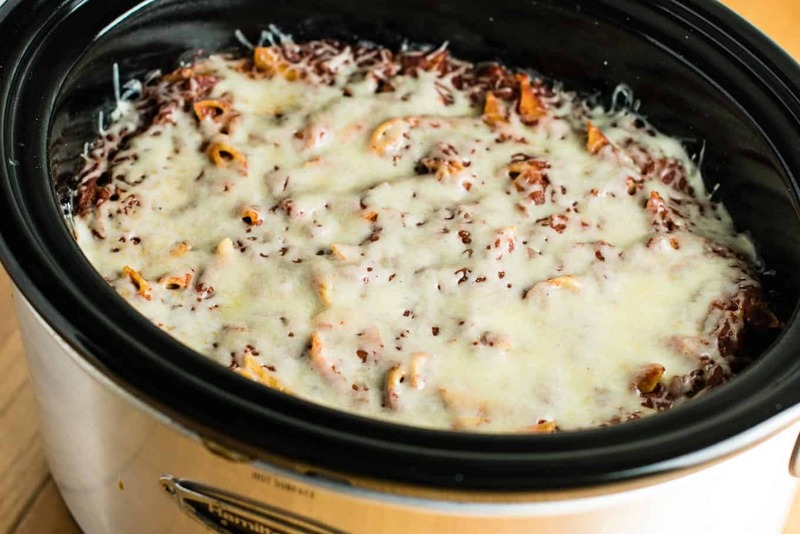 When making crock pot baked ziti, there is no need to cook the noodles first. All you need to do is arrange the layers of noodles, sauce, and ricotta mixture and it’s time to start cooking! The noodles will cook in the sauce, and the recipe allows for enough sauce to ensure that your noodles get cooked without being dry. I love how simple this recipe is and every time I make it people devour it! The key to avoiding squishy penne noodles is to check the slow cooker baked ziti very closely towards the end of cook time. In my experience, right around 2 1/2 hours on high yields a perfectly cooked but not too squishy pasta. The number one complaint of crock pot pasta is that it gets too soft, but this can be avoided if you do not cook it too long. The texture of crock pot pasta is naturally different than what you would get by cooking it on the stove, but you don’t have to compromise all of your texture. Make sure to cook just long enough to where everything is done but the noodles have not turned to mush. Watch your ziti very closely towards the end and you will have perfectly cooked pasta without hardly any work. I’m a big fan of making ziti in my crock pot! This would also be a great dish to take to a potluck or feed a crowd for a family get together. Next up: my favorite way to cook elbow noodles in a slow cooker! 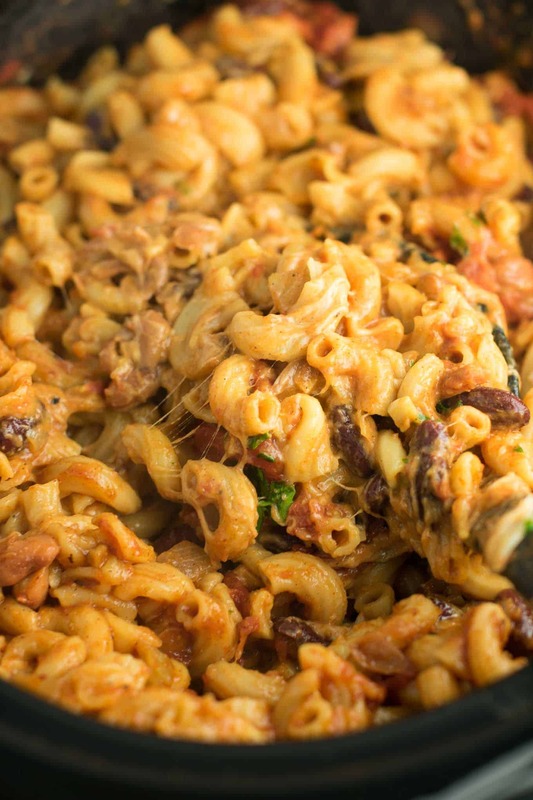 Chili mac is a delicious fall favorite full of comforting cheesy goodness. 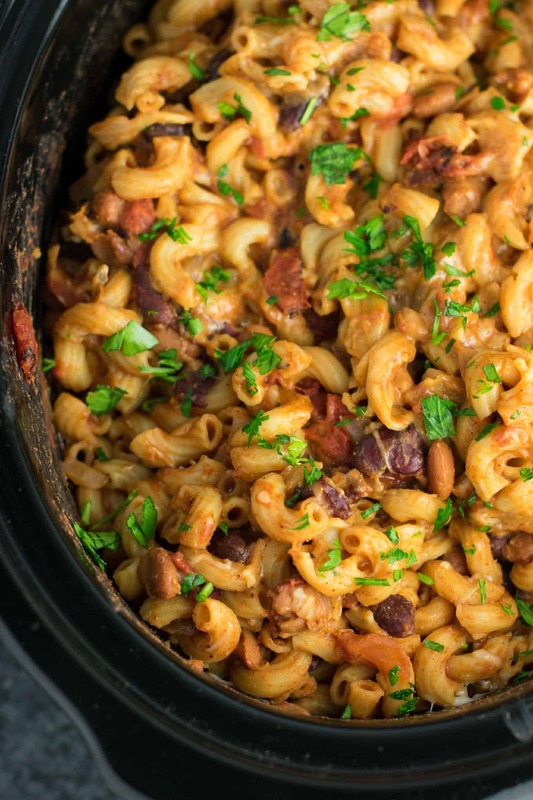 Chili mac is so simple to make in the crock pot. Traditional chili mac uses macaroni noodles, which will get soft very quickly if you are not careful. The best method for making chili mac in the slow cooker is to cook all of the ingredients for the chili part first. Once the chili is done, it’s time to add the macaroni noodles. The chili will be boiling hot, so the macaroni noodles will cook quickly. You will only need to leave them in the slow cooker for 20 or 30 minutes and they will be cooked! That is it! Much longer and they will turn to mush. Again, cook time is very important here, so check for doneness often and stir frequently. The noodles will increase in volume very rapidly and will cook faster than you think. Keep stirring and checking once you hit that 15 or 20 minute mark – they should be very close! These are just two ways in which you can easily cook pasta in the crock pot. All types of pasta vary in cook time, so the most important thing you can do is to check often for doneness to avoid any overly soft noodles. 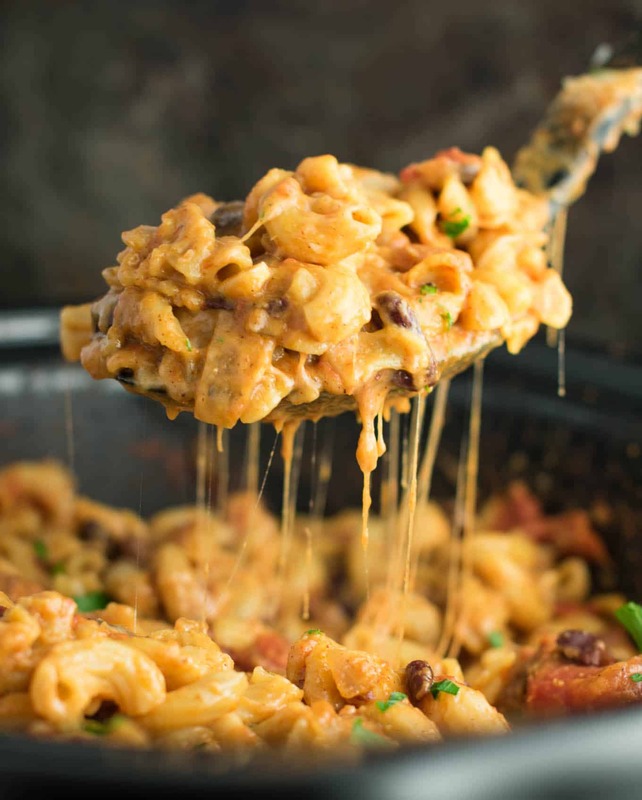 From pasta soup in the crock pot to baked ziti in the crock pot, there are so many ways that you can enjoy pasta in your favorite crock pot recipes! 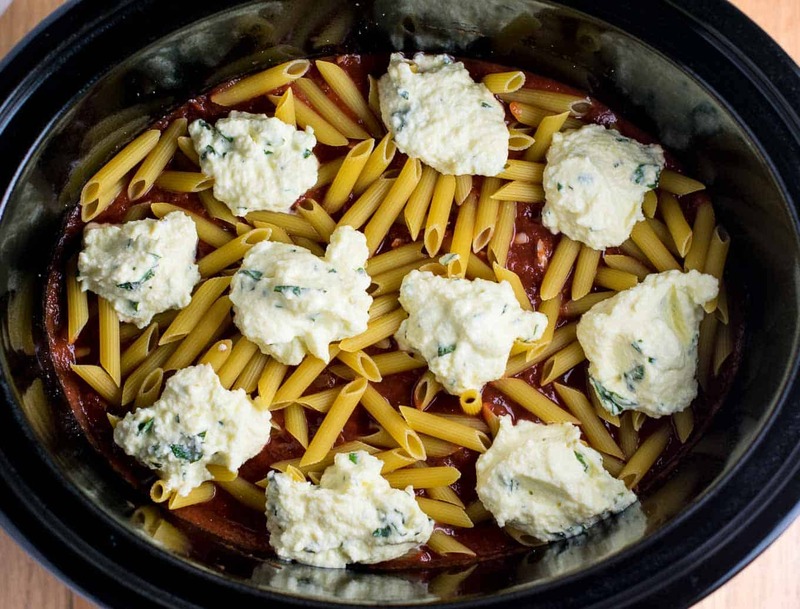 Do you have any favorite crock pot pasta recipes? I want to know!